A 1931 OM-28 in fact, which I happened upon while acquiring various guitar sample videos at Mandolin Brothers. Like me, it was well worn and had seen better days. But it’s one of the best sounding OM-28s I have played. So I took the time to do a quick take of a full tune. Not a perfect take, but I liked it enough that I set to a slideshow of photos taken across the English countryside. A reader asks about the possible companion for his much loved OM-21 and if the OM-28 might be too similar. Is the new OM-28 essentially the same as the OM-21 but for the binding and inlays? I ask because I have the OM-21 (2012) and love it, and I’m looking for another guitar that is similar (in tone) but also a little different. Maybe the new 000-18 or the CEO-7? Thank you for your question, Eric. I have not seen the new OM-28 yet in person, but yes, you are basically correct. Higher grade rosewood and spruce for Style 28. 28 gets herringbone purfling around the edge of the top, 21 has no top inlay around the edge. 28 gets grained ivoroid binding, 21 gets black tortoise shell binding. 28 gets a bridge that looks more like the vintage Martin bridges, the 21 does not. The 28 gets a vintage zig-zag back strip and Style 28 trim around the edge of the back, the 21 gets the similar Style 18 back strip. Until recently, the OM-21 was made with a rosewood fingerboard and bridge, and that gave it a different sort of sound compared to today’s OM-21. The new OM-28 is essentially identical to the now retired OM-28V from the Vintage Series, only it has lost its modified V neck with the traditional taper and 2-5/16″ string spacing, for the new High Performance neck that Martin was put on the 000-18, D-18, OM-21, OM-28. 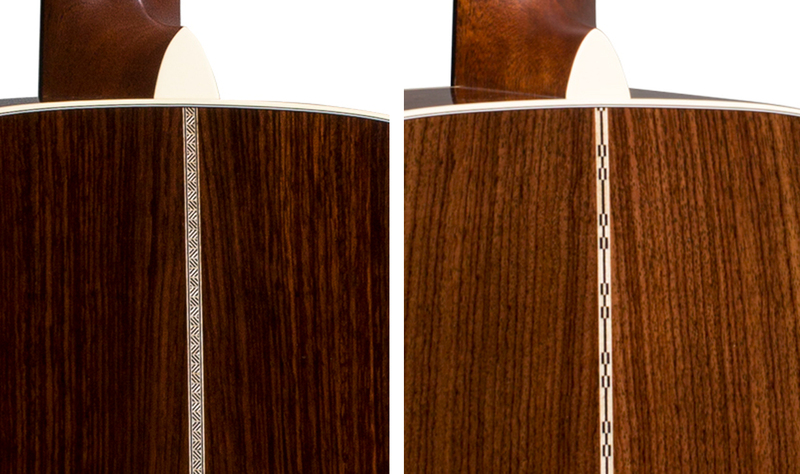 The important differences between the necks are found in the shallow modified low profile on the back of the HP neck, and the “taper” (the traditional Martin OM neck was 2-1/4″ at the 12th fret, the HP neck is only 2-1/8″,) and the HP string spacing is 2-3/16. The new OM-21, like yours, has a fuller body down in the voice and a darker, thicker bottom end compared to the old OM-21, so it is much more like the OM-28V and the old OM-28 (retired in 1994.) And other than cosmetically better looking wood, there will likely not be much difference in the tone of the new OM-28 compared to your current OM-21. So if you want something in the same size that differs more from your OM-21 the CEO-7 and 000-18 are both good choices. The CEO-7 has a different body shape, that is a little longer and a little narrower, but has the same depth to the sides. The neck is fuller in the hand as well, but it is has the short-scale neck. The 000-18 also has a short-scale neck, but it is the same shape and has the same taper as your OM-21, so it widens to a lesser extent as you go up the neck compared to the CEO-7. The 000-18 comes with a Sitka spruce top, so it will sound more like your OM-21 compared to the CEO-7 which has Adirondack spruce. Adirondack has a drier tone with a pronounced ring. The fundamental notes are not as thick, but they have great projection and clarity. Neither will have the same thick warmth in the undertone or as complex harmonics as your OM-21, as mahogany sounds more open and less somber than rosewood guitars. The 000-18 will sound most similar in terms of balance and dynamics, the CEO-7 will have greater bass response and thinner trebles but with a deeper basement under them, as it were. I was traveling sans internet yesterday, when Martin announced the lineup of new models, which will debut at the 2014 Spring show in Frankfurt, Germany. As expected, Standard Style 28 has received a makeover, following in the footsteps of the one that appeared with the fabulous D-18 and the upgraded OM-21. Gone are the much loved OM-28V of the Vintage Series and the pricier OM-28 Marquis. In their stead is the first Standard OM-28 since 1994, melding vintage appointments like herringbone top trim and the classic short pattern diamonds and squares on the fingerboard, with modern design features like Martin’s High Performance neck and a short drop-in saddle in a 30’s style bridge. 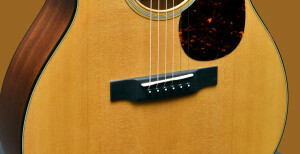 The High Performance neck combines a modified low oval profile with the Performing Artist Taper, which first appeared on the guitars in the Performing Artist Series. It features a 1-3/4″ width at the nut but tapers to 2-1/1/8″ at the 12th fret, adding up to a sleeker faster and thoroughly modern neck. But unlike the PA models, the profile of the neck used on the revamped guitars in the Standard and Retro Series is not as shallow and flat in the back, providing a bit more traditional feeling in the palm of the hand. Basically this new model replicates the look and feel of the OM-28 Retro model, only without the on-board electronics, and with a bone saddle rather than the Tusq used for the acoustic-electric Martins. The new 000-18 likewise sports the High Performance neck and 30s bridge, having already traded in its rosewood bridge and fingerboard for ebony some months before. But this latest edition also gets scalloped braces to go along with its more-vintagey appointments. And about time too, I say. As with the OM-28, this new 000-18 is basically identical to the 000-18 Retro, which appeared at Winter NAMM, minus the electronics. The DC-Aura GT and GPC-Aura GT are made of Indian rosewood and Sitka spruce, with the full Aura F1 Plus pickup system, and African blackwood bridges. But you will have to wait for Summer NAMM for the even more exciting rosewood model! Will the snow never melt! ?